Saul Steinberg (1914-1999) was one of America’s most beloved artists, renowned for the covers and drawings that appeared in The New Yorker for nearly six decades and for the drawings, paintings, prints, collages, and sculptures exhibited internationally in galleries and museums. Steinberg’s art, equally at home on magazine pages and gallery walls, cannot be confined to a single category or movement. He was a modernist without portfolio, constantly crossing boundaries into uncharted visual territory. Born in Romania, Steinberg studied architecture in Milan, fled Fascist Italy in 1941, and arrived in New York the following year. Wartime military service with U.S. Naval Intelligence and the Office of Strategic Services (OSS) took him to China, India, Algeria, and Italy. Returning to New York, he won a lofty place among the artists publishing in The New Yorker and other mass-circulation magazines. Steinberg’s career in the art world kept pace with commercial work. His first one-artist exhibition was held in 1943 at the Wakefield Gallery, New York. Three years later, he was among the “Fourteen Americans” in a landmark show at The Museum of Modern Art, his works exhibited alongside those of Arshile Gorky, Isamu Noguchi, and Robert Motherwell. Three major New York galleries have represented Steinberg, beginning with Betty Parsons and Sidney Janis and, since 1982, The Pace Gallery. To date, more than eighty solo shows of his art have been mounted in galleries and museums throughout America and Europe, including a retrospective at the Whitney Museum of American Art (1978) and another at IVAM, the Institute for Modern Art in Valencia, Spain (2002). In 2006, “Steinberg: Illuminations,” the first comprehensive look at his career, set off on an eight-stop tour of the US and Europe. Most recently, “Saul Steinberg: The Americans,” a reinstallation of his colossal murals for the 1958 Brussels World’s Fair, opened at the Museum Ludwig in Cologne. Steinberg defined drawing as “a way of reasoning on paper,” and he remained committed to the act of drawing in an era dominated by large-scale painting and sculpture. Throughout his long career, he used drawing to ponder the fabricated temper of modern life. Famed worldwide for giving graphic definition to the postwar age, he crafted a rich and ever-evolving idiom—one that found full expression through parallel careers as an exhibiting artist, designer, muralist, and a self-described “writer who draws.” Sometimes with affection, sometimes with irony, but always with virtuoso mastery, Saul Steinberg peeled back the carefully wrought masks of 20th-century civilization. 2010 – “Graphic Masters III: Highlights from the Smithsonian American Art Museum”, Smithsonian American Art Museum, Washington, D.C.
1979 – “Saul Steinberg”, Washington, D.C.: Hirshhorn Museum and Sculpture Garden, Smithsonian Institution; London: Arts Council of Great Britain, Serpentine Gallery; Saint-Paul: Fondation Maeght. 1974/75 – “Saul Steinberg: Zeichnungen, Aquarelle, Collagen, Gemälde, Reliefs 1963-1974.” Cologne: Kölnischer Kunstverein. Traveled to: Stuttgart, Württembergischer Kunstverein; Hannover: Kestner-Gesellschaft; Graz: Kulturhaus der Stadt Graz; Vienna: Museum des 20. Jahrhunderts. 1973 – “Steinberg at the Smithsonian: The Metamorphosis of an Emblem”, National Collection of Fine Arts, Smithsonian Institution, Washington D.C.
1973 – “Saul Steinberg.” New York: Sidney Janis Gallery and Betty Parsons Gallery. 1973 – “Saul Steinberg.” Milan: Galleria Mario Tazzoli. 1971 – “Paintings and Drawings: Saul Steinberg.” Los Angeles: Felix Landau Gallery. 1970 – “Steinberg.” Houston: Kiko Galleries. 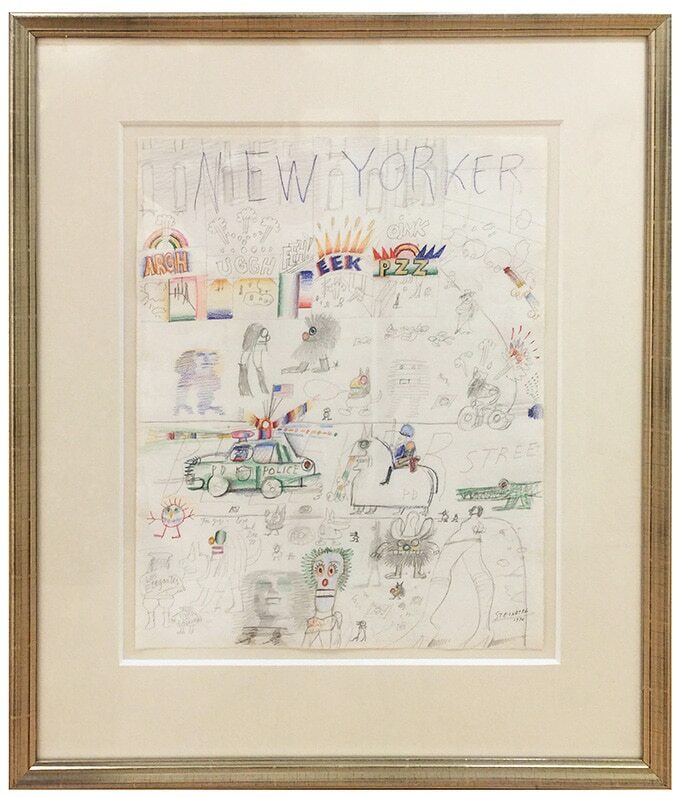 1969 – “Drawings by Saul Steinberg.” New York: Sidney Janis Gallery and Betty Parsons Gallery. 1968 – “Steinberg: Dibujos y Acuareles.” Caracas: Museo de Bellas Artes. 1966 – “Steinberg.” Paris: Galerie Maeght. 1966 – “Saul Steinberg.” New York: Sidney Janis Gallery and Betty Parsons Gallery. 1954 – “Steinberg.” Hannover: Kestner-Gesellschaft. 1953 – “Steinberg 1953.” Paris: Galerie Maeght. 1953 – “Saul Steinberg.” Amsterdam: Stedelijk Museum. 1952 – “Saul Steinberg.” New York: Betty Parsons Gallery and Sidney Janis Gallery. 1952 – “Saul Steinberg.” São Paulo: Museu de Arte. 1952 – “Saul Steinberg.” London: Institute of Contemporary Arts. 1951 – “Steinberg.” Rome: Galleria L’Obelisco. 1950 – “Saul Steinberg.” New York: Betty Parsons Gallery.